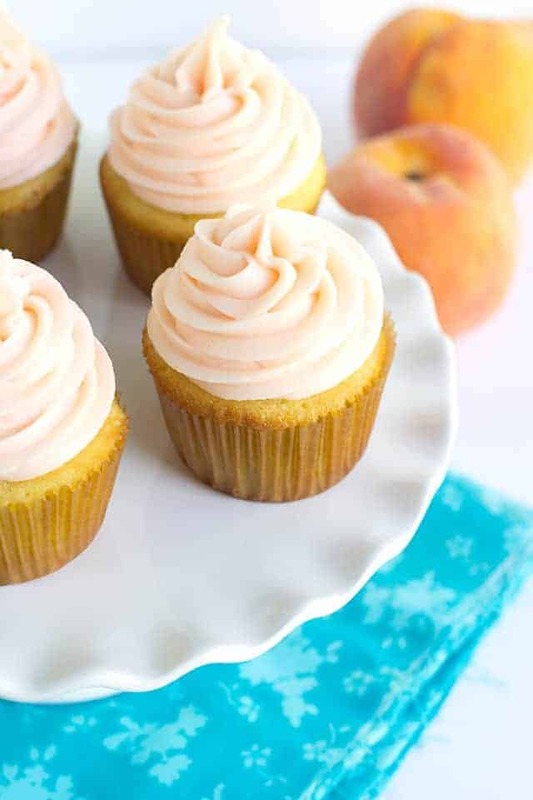 These yellow cupcakes with peach cream cheese frosting need to happen at every party. The yellow cake is so light and fluffy and the peach cream cheese frosting has a nice pop of flavor! Did I mention that peach colored frosting? LOVE! 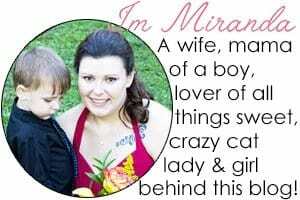 Today we’re throwing a baby shower for Angie over at Big Bear’s Wife. She was expecting her baby next month, but he came this week! Some of us bloggers got together to throw her a little virtual baby shower! I’ve had this frosting idea in my head for a while. I thought a baby shower is a perfect time to try it out. Not only was I super excited about the flavor, but the color turned out totally perfect as well. I’ll tell you my secret right now. Peach jello. Can you believe that? No peaches were even used in the frosting which is fine since getting a good, juicy sweet peach only happens seasonally. 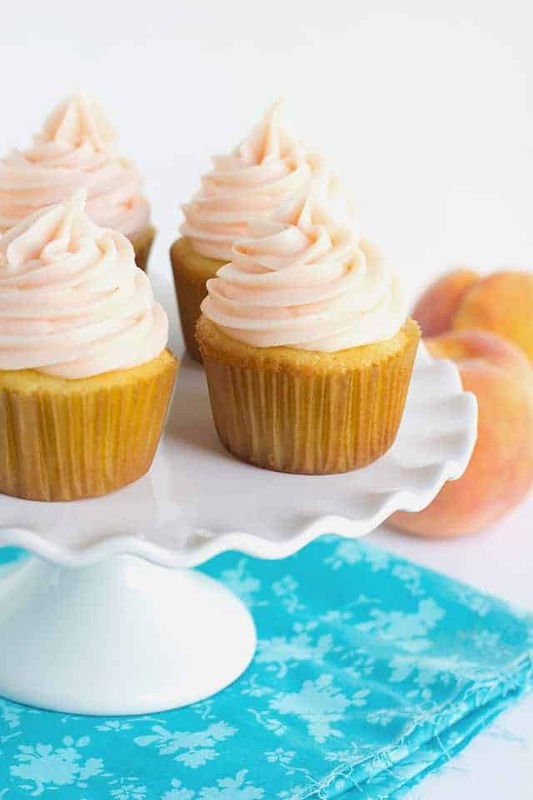 You could add a peach filling to the cupcakes though. I would recommend doing that the same day as you plan on eating the cupcakes to avoid a soggy cupcake. I wish I could show you the center of the cupcakes to see how fluffy they were. I had intentions on getting a shot for you. I’ve got to tell you how it came about that I was unable to get a picture for you ladies and gents. I like to throw my cupcakes in the freezer for a few minutes before cutting them for the pictures. The frosting firms up and makes for a cleaner and prettier cut that way. Our new pup, Ferdinand, was laying down in my little “studio” while I worked. I shoot just a few inches off the floor. This will be useful information in just a few seconds. He was sound asleep by the door behind my whiteboard. I jumped out into the kitchen to pop a cupcake in the freezer. I walked into the living room to check my emails quick while I was waiting. I walked back into the studio not even 5 minutes later and that cute little stinker who isn’t really little had eaten a whole cupcake and it’s wrapper and cleaned the frosting off from every other cupcake that was there. That one, he’s apparently not trustworthy. I forget that he’s still very new to our family and has so much to learn. 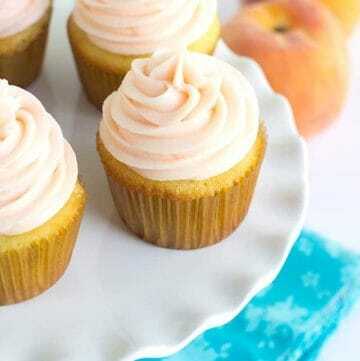 These yellow cupcakes with peach cream cheese frosting are light and fluffy. 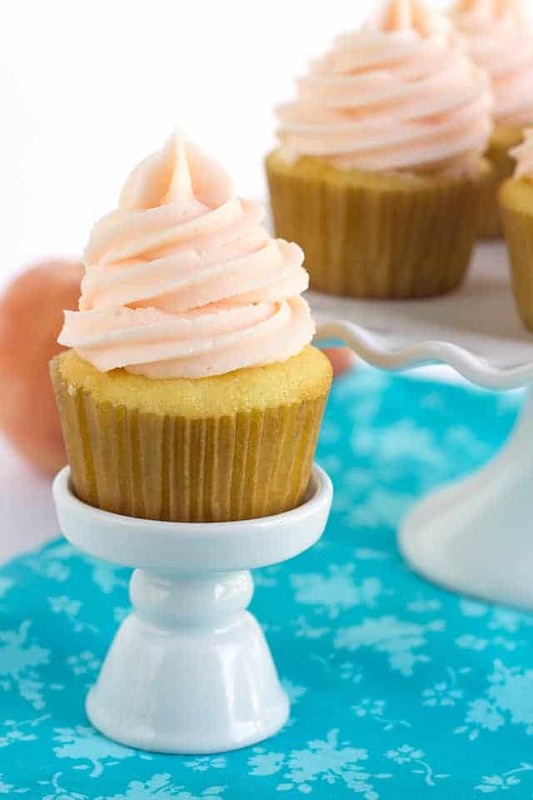 The cream cheese frosting is has the perfect peach flavor and color. In a large bowl, cream together the butter and sugar until light and fluff. Add in the vegetable oil and one egg at a time. As soon as each one is incorporated, add another. Once all the eggs are combined, beat for an additional 2 minutes. It will become thick and very pale. Measure out the buttermilk and add the vanilla extract to it. Set aside. In a separate bowl, sift together the cake flour, baking powder, baking soda, and salt. Stir to incorporate. Alternately add the flour and milk mixture, starting and ending with flour. Mix on medium speed until combined. Fill the cupcake liners about two-thirds full. Place into the preheated oven and bake for 17 minutes. Test the centers of the cupcakes with a toothpick to make sure they're done. Moist crumbs are okay, batter is not. In a large bowl, add in the butter and cream cheese. Beat until smooth. Add in the dry jello mix, powdered sugar, and milk. Beat until incorporated. If it's too thick add an additional tablespoon of milk. For a fluffier frosting, beat on high for 30 seconds to 1 minute. Add the frosting into a piping bag fit with a 1M tip. Pipe swirls on top of the cupcakes. I made the Yellow Cupcakes with Peach Cream Cheese Frosting. The frosting is grainy. How can I fix this?